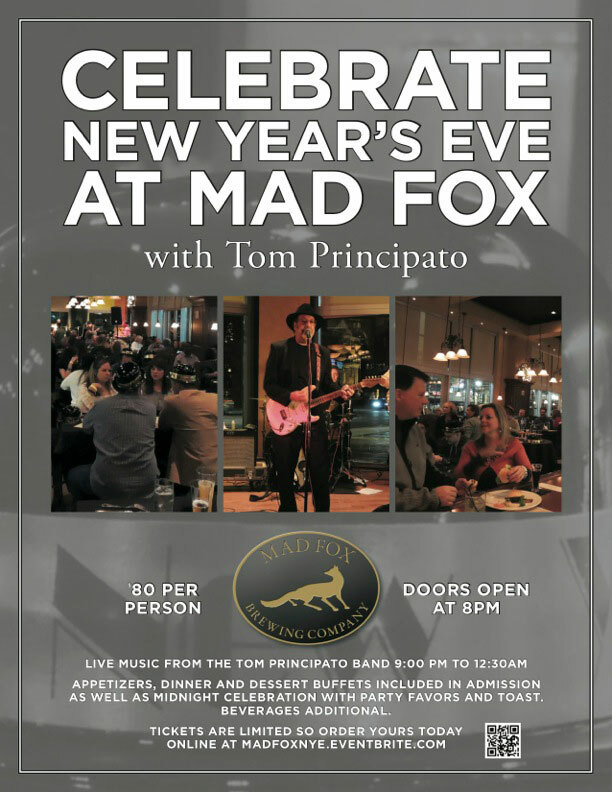 Ring in 2015 with a special performance by international recording artists – and legendary Washington area blues singer/guitarist – The Tom Principato Band (along with special guest Tommy Lepson) – at Mad Fox Brewing Company in Falls Church, VA (444 W. Broad Street – www.madfoxbrewing.com – Free onsite parking) on Wednesday, December 31, 2014. One of the best deals of its kind in the region, the Mad Fox New Year’s Eve Celebration will include live entertainment, a chef-inspired menu with passed appetizers and both a dinner and a dessert buffet, party favors and a celebratory toast at midnight. A limited number of tickets, priced at $80 per person, are now on sale. Doors open at 8pm with the performance and buffet starting at 9pm. Click HERE for full details, menu and to purchase tickets!